This guide discribes the recomended workflow for the production of ADA compliant Braille signs using a Roland VersaUV printer and Roland VersaWorks Dual. Print and place templates offer a great solution for printing objects on the fly that may require a jig when the job is either too small or the deadline too tight to have a proper jig produced. 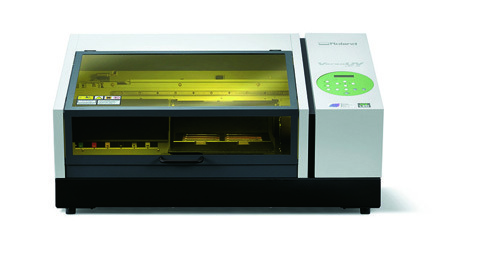 The following document covers the things you need to know about the VersaUV LEF-12 Benchtop UV-LED Printer. Updated 8/10/2011. This zip file contains firmware for LEF-12 printer. Zip file also includes updater application, Firmware file and instructions on installation. Hoja De Datos - PrintPRO Base para LEF-12 impresora. The following document outlines the important points to check prior to printing and provides countermeasures for ink misting and UV light reflection. NOTE: Failure to follow these points could result in ink dropout or print head damage. The following is the complete users manual for the LEF-12. The following document outlines the proper installation procedure for replacing the wiper on the LEF-12. Zip file contains a new profile for LEF-12. This new profile produces a smoother print surface. Zip file contains the template for iPhone4/4S and golfball and print test file. Use the templates to generate print files to be used with the jigs (part #LEF12Jig-iP4-GB) for LEF-12. The following document outlines how to repack the LEF-12. Roland LEF Series video on how to maintain your LEF-12, LEF-12i, LEF-20, LEF-200 & LEF-300. The following videos shows how to properly load materials on the LEF-12 and covers 2 point & center registration using the built in laser pointer. The following video shows how to output files using Roland VersaWorks. Please review the LEF-12 Material setup video here on YouTube and the VersaWorks White & Gloss Ink Guide located on Roland's support site. ​The rotation option in Versaworks is unavailable for this machine.